"With iLevel, I can now walk with my peers, reach higher shelves, and live what other people see as a normal life." With a passion for fitness, hockey and living life, Alison Chancellor maintains her independence with her Q6 Edge® 2.0 with iLevel®. The word ‘can’t’ isn’t in Alison Chancellor’s vocabulary. She is inspired to do things that other people believe are impossible for someone with a disability. Born with spastic quadriplegic cerebral palsy, Alison previously used a reverse walker to get around in school. As she grew older, the school hallways became too large and she began using a wheelchair. Currently, she uses the Q6 Edge® 2.0 with iLevel®. 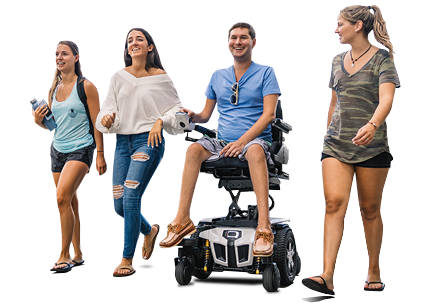 “With iLevel, I can now walk with my peers, reach higher shelves, and live what other people see as a normal life,” Alison said. She recently attended a wedding and hugged the groom’s neck, instead of his waist. Alison loves to be active and recently participated in adaptive rock climbing for the first time. “I’m passionate about fitness because it allows me to retain and gain strength, helping me maintain my independence,” Alison said. In addition to her love for fitness, Alison is a diehard hockey fan and cheers for her beloved St. Louis Blues. 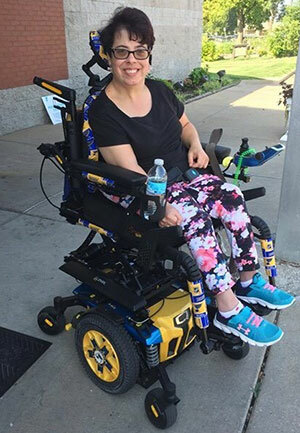 Her fandom is evident with the St. Louis Blues custom design shroud and drive wheel accents on her power chair. Alison is a firm believer in advocating for the disability community. She has performed with a theatre troupe that promotes disability awareness, acting out true stories about the culture of disability. Life is full of challenges and Alison faces them head on. “I’ve learned to play the cards I’m dealt,” Alison said. And thanks to iLevel, she no longer struggles and has peace of mind.